Click the links below to find out more about our games. 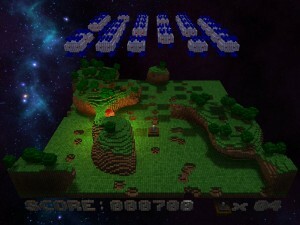 About: Voxeliens is a retro-style arcade shooter for the PC, in which you defend your planet from waves of descending enemies. The gameplay is simple and fast paced as you battle your way through different environments using a variety of powerups. Think Space Invaders would have been better in 3D? You’re right, so download the demo and play the first few levels for free… then buy the full game for just $3.99! Name: The Peasants are Revolting! About: The Peasants are Revolting! is a game which we created in 72 hours for Ludum Dare 33. The theme for this Ludum Dare was ‘You are the monster’ and we used this as an opportunity to test our early work on integrating Cubiquity with Unreal Engine 4. 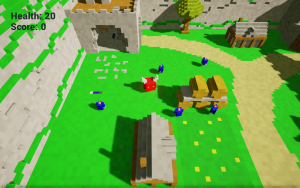 We began with UE4’s ‘Twin Stick Shooter’ template, and over the three days we replaced almost all of the art and code to create a new game we can call our own.